CarGurus has 3,387 nationwide Prius Prime listings starting at $17,000. Let’s start with the basics: the generically named Toyota Prius Plug-in has been re-born as the Toyota Prius Prime—effectively meaning the “best” Prius. Essentially, plug-in hybrids work like electric cars for a restricted length of time before engaging a gasoline-powered engine either as a generator to recharge the battery or, under more taxing circumstances, to drive the wheels. The standard hybrid Toyota Prius has been the poster-car of efficiency and green technology for much of the 21st century thus far, but plug-in hybrid technology was actually brought to market by Chevrolet via the Volt. 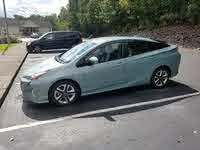 To say that the plug-in hybrid Prius is the best Prius indirectly commends Chevrolet for this innovation. Perhaps it’s true that competition breeds excellence. Speaking of excellence, Toyota does not hesitate to declare the Prime’s superiority. Beyond revamped styling that, highlighted by a distinctive rear taillight array, also marginally lengthens, widens, and lowers the car, Toyota has reduced weight thanks to an aluminum hood and carbon fiber in the rear hatch. This is a car focused on efficiency rather than performance, so don’t act surprised when you read about its 1.8-liter Atkinson-cycle 4-cylinder engine (the same as what’s found in all other 2016-and-newer Prii). If speed numbers are important to you, consider the car’s ability to cruise along at 84 mph exclusively under electric power. Like we said, it’s not a performance car, but 84 mph is impressive enough for a plug-in hybrid commuter car and most likely above the posted speed limit anyway. Although probably not at 84 mph, the Prime will be able to drive under all-electric power in EV mode for 22 miles (doubling the outgoing model’s range), continuing in hybrid mode beyond that. 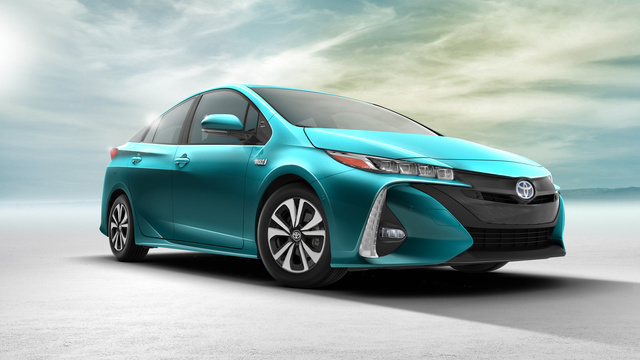 An expected 120 miles per gallon equivalent (MPGe) will put the Prius Prime above all other competitors in terms of fuel economy, largely due to the car’s efficiency as a hybrid—Toyota is expecting the Prius Prime to deliver equal or better fuel economy than the standard Prius liftback in hybrid mode. The Prius Prime is expected to reach 600 miles between fill-ups, and its 8.8kWh battery can be charged using a standard 120-volt outlet. A full charge via 120 volts should take only about five and a half hours, but that wait can be cut in half if you have access to a more powerful 240-volt socket. Interior details don’t often take center stage in efficiency-oriented vehicles, but Toyota insists the Prius Prime will change that expectation. Available leather upholstery and a sound-deadening laminated windshield are expected to make the Prime feel more upscale than your typical commuter car. For comfort-upon-arrival, the air conditioning system can be activated remotely via the key fob. An available 11.6-inch high-definition display acts as the infotainment centerpiece, while a head-up display will help drivers keep their eyes on the road. Additional tech-oriented features include a USB 2.0 port, wireless phone charging, a 10-speaker JBL audio system, and SiriusXM and HD Radio, with the Entune App Suite allowing for additional features. All Prius Primes will also be available with Toyota Safety Sense, a suite of safety technology that's becoming standard across the Toyota lineup. Pre-collision features include automatic braking, pedestrian detection, lane-departure alert with steering assist, blind-spot monitoring, and rear cross-traffic alert. In addition to these helpful tools, the Prime can be had with dynamic radar cruise control (capable of fully stopping the car) and automatic high beams. National Highway Traffic Safety Administration and Insurance Institute for Highway Safety ratings aren’t available for this brand-new model, but it’s hard to imagine it scoring anything other than top marks. What's your take on the 2017 Toyota Prius Prime? 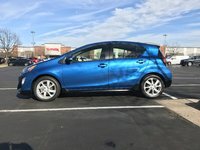 Users ranked 2017 Toyota Prius Prime against other cars which they drove/owned. Each ranking was based on 9 categories. Here is the summary of top rankings. Have you driven a 2017 Toyota Prius Prime?